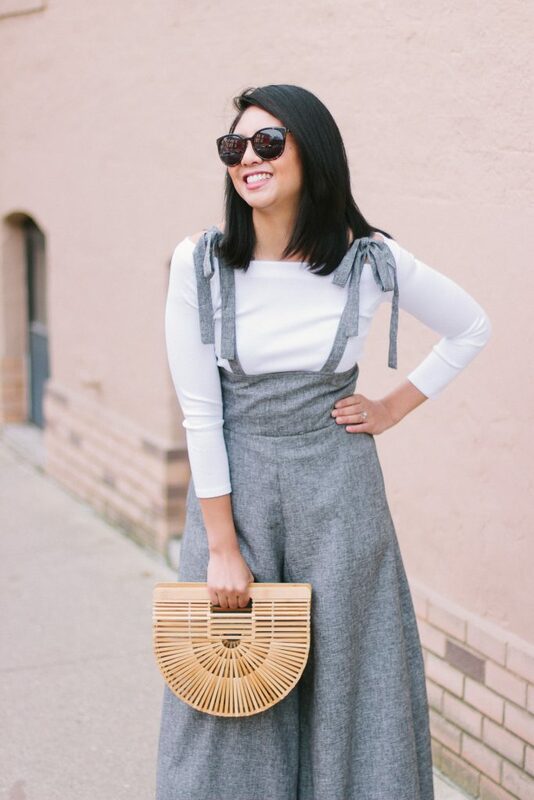 If you’re into high waisted wide-leg pants, oh you are in for a treat with this outfit! This jumpsuit is made for you! If you can’t tell by the photos, it is extremely high waisted and the bottom is very wide-leg. Let me tell you, I felt amazing wearing this jumpsuit! 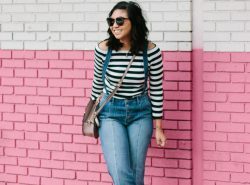 It is so different than your average jumpsuit style. I know, I know, it is me with another jumpsuit. I told you the obsession is real! Sorry, I’m not sorry! 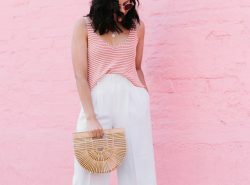 Aside from the high waisted wide-leg pants features, what’s nice about this jumpsuit is that there is a zipper in the back to pull this jumpsuit together. So really, you don’t need the ties to hold it up. But I think the ties add a darling detail! As for sizing, I went with a medium. I wasn’t sure how fitted the waist was going to be. I’m glad I went with a medium because it fits comfortably. The original length was quite long so I did get it hemmed. I took a couple inches off. I did keep it a tad bit longer than floor length because I knew I wanted to wear heels with it. For reference, I am wearing these Marc Fisher heels (last seen on my birthday post and several others haha – it is my favorite pair!) and they’re just under 3 inches tall. If you look closely at my photos, you’re able to see my heels peek through. Btw, I’m 5’4″ if you need a height reference. It has been awhile since I hosted a giveaway and I am bring it back! 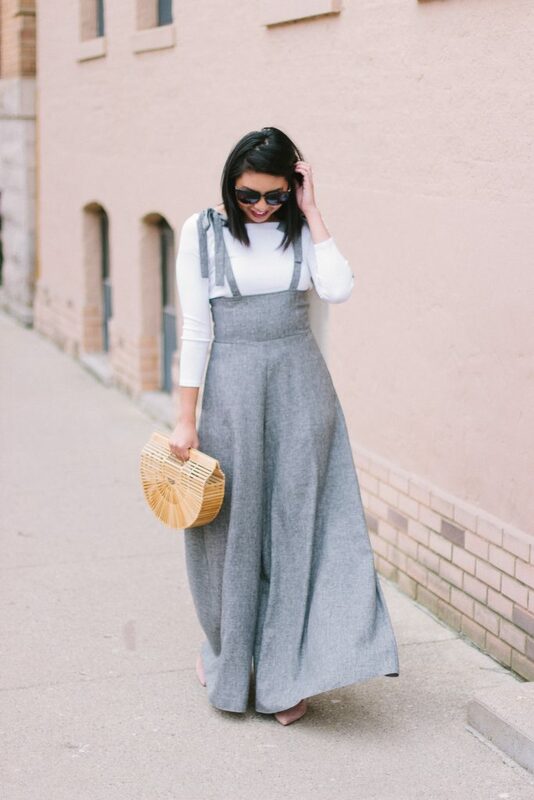 Okay, I am SO obsessed with this wide-leg jumpsuit! I have been jumpsuit obsessed as well, so I may just have to pick up this one. It’s so different than what I have been seeing. Aren’t they the best? Hope you like this one as much as I do! You styled this jumpsuit perfectly lady! So cute! This is a great jumpsuit! YOU LOOK SO DAMN CUTE IN THAT JUMPSUIT! Seriously though, what a great piece to have in your wardrobe! Thais Jumpsuit is so cute!! I am loving this adorable jumpsuit! It looks so cute with the high waist and the wide legs! I am petite in height too so it’s good to know this can work! Thank you Rebecca! It totally can work with a bit of hemming! Gorgeous jumpsuit. Thanks so much for the height reference. I’m 5’3″ so I would totally need to hem this as well — if I were to buy it. It’s seriously beautiful on you. And I’m loving your hair straightened. No problem! I figured sharing my height would be helpful. And thank you about the hair! I think I will straighten it more often! I am all about dramatic wide leg! I love this jumpsuit so much! I have one similar to this but the zipper broke and I have to fix it lol. Oo girl me too! Oh no, I hope you are able to get it fixed! Omg this is suuuuuch a cute jumpsuit on you!! I’m obsessed with how flared the legs are and how you styled it. So chic! This jumpsuit looks so amazing!! I really love it. This is the cutest jumper, Rach! Checked it out immediately! I cant believe it’s only $19! STUNNING ON YOU! Legs for days! I love how simple and chic this jumpsuit is and it looks bomb.com on you! Love love love this jumpsuit, you look absolutely stunning! You are rocking this jumpsuit! Such a fun look on you! You are really pulling those wide-legged pants off. I’m impressed! I love that summery bag. 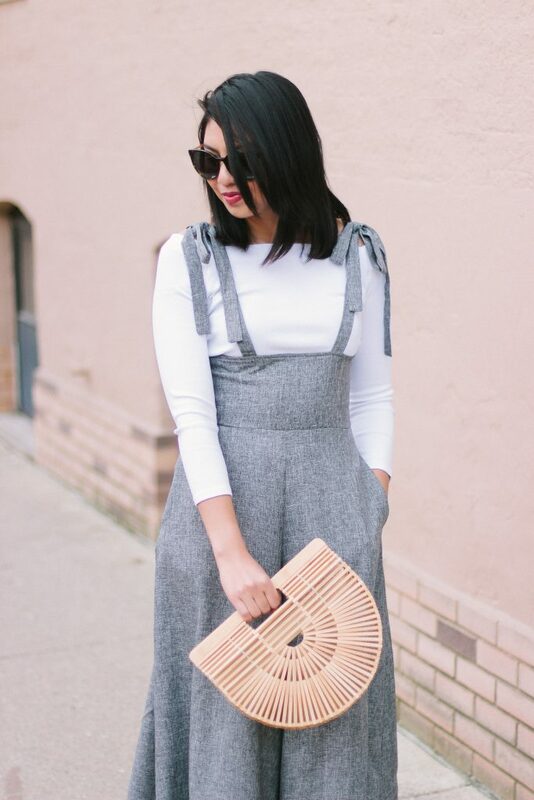 Loving how you rock those wide-leg pants Rach! Thank you Laura Leigh! You would look so good in it! This is such a fun jumpsuit! Love the wide leg pants! I have yet to be daring enough to rock a jumpsuit but this is making me want to go for it because you look SO chic and adorable! Love it! You look beautiful in this jumpsuit! I love the wide-legged! OBSESSED with this look!! Love the mix of proportions! Who wouldn’t love pants like this. It is vintage and is super classic. I am happy that this trend has come back. This is such a unique outfit- I don’t think I could pull it off but you are rocking it! So you look absolutely amazing in this. I don’t think I could pull it off, but this is serious inspiration!